Discuss this and other Mother's UI pieces here. I think this is finally ready for public consumption. It's certainly the biggest project I've yet worked on, so it's initial release is bound to have a few problems. Hopefully they're minimal. The map spoiler project is a companion for eq2map. 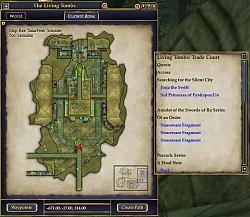 It is a seperate window which has an alphabetical list of all the POIs on the eq2map divided by type. If you've ever tried to mouse over every icon on the map trying to locate the next step of a quest, or a certain NPC, then you have a very good idea why this project was started. Clicking on a POI in the list will generate a waypoint to that POI. The POIs are pulled from the eq2map database, so submitting a point to eq2map will find it's way to the map spoiler. There is currently no auto-update for map spoiler. Anyone who wants to help me write one is welcome to PM me. This mod uses eq2map plug-in slot 7. I don't believe anything else is using it. The above is important! Most of the problems people have had installing the map spoiler have come from the extra include line not getting added, or it getting added and then subsequently removed by another UI mod. If you're seeing a black window with no controls (with or without blue text) double check the include. The zip file now includes "eq2ui_mainhud_example.xml". If you do not have any other mods that modify "eq2ui_mainhud.xml", you can just right-click the eq2ui_mainhud_example.xml and rename it to eq2ui_mainhud.xml. Spoiler page doesn't populate the first time you open the map window. Press 'M' a few times to open and close it and the window should populate. Spoiler page doesn't always change when you zone. This doesn't happen all the time, so it's hard to troubleshoot. Fixed to work with EoF. Added EoF POIs. I was defeated by a single character. Which is why it took so long to fix! But it appears working now. Thanks for the patience. Updated POIs for KoS zones. Updated POIs for outdoor KoS zones. Now example_eq2ui_mainhud.xml included with zip file. Support for additional zones including the outdoor KoS zones. The map spoiler project has the ability to accept manually written spoilers. (For example with step by step guides for quest series arranged chronologically.) If you would like to submit one for a zone, please contact me and I will provide you with the extreemely simple text format in which manual spoilers should be written. No XML knowledge required. This mod could really use a simple search function. Often, things I want are in unexpected sections. Things that should be in "Quests" are in "Locations", etc etc. I'd kill to be able to type what I'm looking for instead of scrolling through the poorly organized list. 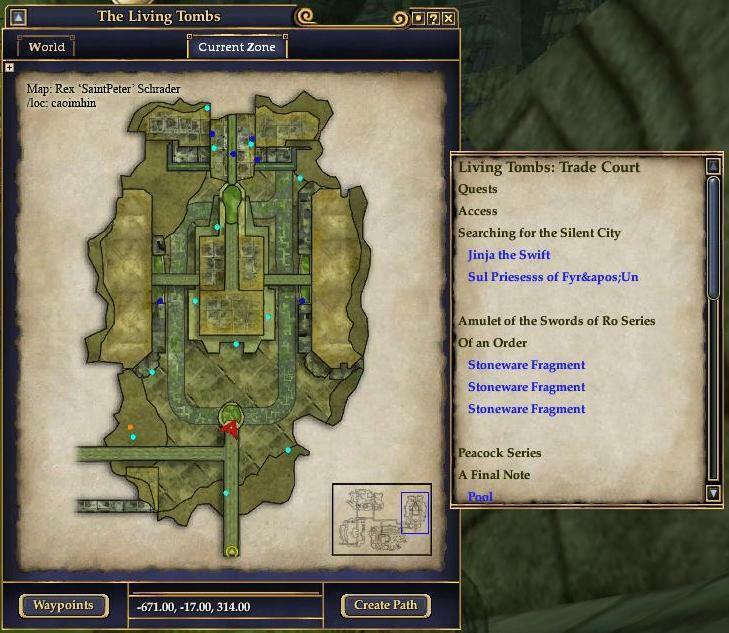 The information for each POI is submitted by players and the Spoiler Project simply uses the EQ2MAP POI information. If you find any that are listed in strange catagories then you can submit updated info to the EQ2MAP site for a given POI, I believe. Mother did an excellent job on this mod but has since moved on to modding for Vanguard so there's no expected updated coming. TreeMos has taken on this project and has since updated the listings and is currently working on a couple of functionality enhancements as well. Last edited by FloridaFringe : 04-01-2007 at 02:15 AM. I got it to work! I still need to finnish adding the plugin7.xml auogen but I now have a script that will atleast give you completely up to date spoiler links for every poi on the map for a zone that was already listed in the plugin7 file. I also added the very helpful feature of having full descriptions appear in tooltips for every spoiler link. I'll post more details in a new and separate thread once I've gotten everything ready to go for public consumption. Hopefully sometime this week. The EQ2MAP updater doesn't alter or replace the eq2ui_mainhud.xml file. If it's constantly being replaced back to default then there's something else going on instead. I would start fresh by coping the default file over to your custome directory and going from there. EQ2 is going on. Anything in the default UI directory is checked against the server's file database and, if it doesn't match, it's considered either corrupted or out-of-date and overwritten with the official copy from the server. That's how all updates to EQ2 are done. You need to put a copy of eq2ui_mainhud.xml in your own UI directory and make the modifications there. This implies also checking for changes to the default file and keeping your private copy up-to-date. I'm poking at a few things to see if I can figure out how to have a private mainhud file say "Oh, include the default one and then add me to it.". I make the appropriate changes to the eq2ui_mainhud.xml file, however, everytime I load EQ2 it dowloads a default file. Do I have to make these changes each time I load EQ2 before actually hitting PLAY or am I missing something. As someone who uses EQ2Map and the spoiler project I had also been wishing the spoiler items could be more up to date with alll the map POIs. So as a sometimes programmer I decided to look into doing it myself. And I have to say it looks quite feasible. I'll start with a simple program to change one map icon_ file into a spoiler file and once I get that working I'll try to upgrade it into something that can quickly scan and convert all and rebuild the plugin_7.xml file. Probably will do it in Java since I know that best or possibly Perl. I'll post here again once and if I've got something others can use. is not my eq2ui_mainhud.xml file. I wonder if the map file changed? If it wasn't there then you wouldn't be able to view any maps, custom and default alike. Regardless, just add the appropriate includes to the bottom of the file and it should work. Last edited by FloridaFringe : 02-17-2007 at 04:09 AM. Where do you put the files? Works great but does it update? I'm using this with EQ2MAP Updater; works great with it - 1 problem tho' as the maps gets updated and the POI evolve - the spoiler does not seem to update. How can I resolve this? I don't minding putting in the work to do a manual update coz I'm familiar with xml (not a pro tho). Last edited by titanax : 02-05-2007 at 08:12 AM. ok im a noob and i dont know where to put these files, could someone tell me where? Will this work with EQ2map auto updater version? If not, can I have both versions on my comp without them messing with each other?